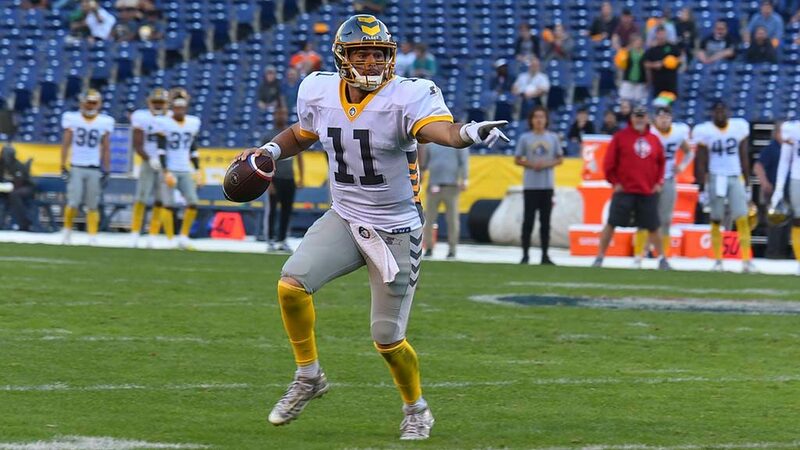 The San Diego Fleet were held scoreless in the second half of a 32-15 loss to the Arizona Hotshots on Sunday in Tempe, Arizona, with quarterback Mike Bercovici throwing interceptions on the final two possessions in his return to his college stadium. Bercovici’s 38-yard touchdown pass to tight end Marcus Baugh seven seconds before halftime cut the deficit to 23-15, but in the second half they punted after three plays, turned the ball over on downs after driving to Arizona’s 1-yard line, missed a field goal and had two passes intercepted on their five possessions. “We seemed to make some key mistakes at times and that seemed to hurt us,” Fleet coach Mike Martz said his team lost its second consecutive game to fall to 3-4 and drop out of a tie for second with the Hotshots in the Alliance of American Football‘s four-team Western Conference. The top two teams qualify for the playoffs. The Fleet had a third-and-goal from Arizona’s 1-yard line on their second possession of the second half. Running back Terrell Watson was stopped for no gain on third down. Bercovici again handed the ball to Watson on fourth down. Watson was stopped short of the goal line by multiple Hotshots defenders, pitched the ball back to Bercovici whose pass intended for tight end Ben Johnson fell incomplete in end zone. Bercovici completed a 41-yard pass to Watson, the game’s longest play, on the Fleet’s next possession. The Fleet picked up a second first down, the drive then stalled and Donny Hageman appeared to make a 44-yard field goal attempt. However, the kick was nullified by a delay of game penalty. Hageman’s 49-yard field goal attempt went wide right. Quarterback John Wolford scrambled 35 yards for a touchdown on Arizona’s next possession, increasing its lead to 29-15, with 6:08 to play. Bercovici threw an interception on the second play of the ensuing drive. Nick Folk kicked a 19-yard field goal four plays later for the game’s final points. The Fleet outgained the Hotshots, 411-391, but trailed 24-22 in first downs and 30:36-29:24 in time of possession before a crowd at Sun Devil Stadium announced at 9,760, the second-largest among their four home games. Bercovici completed 22 of 43 passes for 310 yards, his third consecutive 300-yard-plus performance, with two interceptions. Nelson Spruce caught 12 passes, a single-game high by a Fleet player in their seven-game history. Wolford completed 15 of 19 passes for 212 yards and two second-quarter touchdowns, helping lead Arizona (4-3) to its second consecutive victory following a three-game losing streak. He had one pass intercepted. Both Fleet touchdowns came off turnovers by the Hotshots. Watson ran 3 yards for the game’s first touchdown 3:57 into the first quarter, four plays after Deion Holliman’s fumble at the end of a 5-yard punt return was recovered by Demetrius Wright at the Arizona 15-yard line. Bercovici’s 38-yard touchdown pass to Baugh came four plays after Kameron Kelly intercepted a Wolford pass at the Fleet’s 40-yard line with 40 seconds left in the first half. Baugh appeared to toss the ball away in celebration before running across the goal line. “If I was a betting man, I would say he let go short of the goal line, but I can’t confirm that,” replay official Glenn King said in his conversation with referee Reggie Smith that was shown live during CBS Sports Network’s telecast. Smith discussed with King the possibility that Baugh threw an illegal forward pass. Backup quarterback Trevor Knight ran seven yards for a touchdown the first time the Hotshots offense had the ball . Both teams kicked field goals on their next possessions, with Hageman kicking a 47-yarder and Folk a 54-yarder. Wolford threw 26- and 15-yard touchdown passes to tight end Thomas Duarte and Holliman, a receiver, on consecutive possessions in the second quarter, giving Arizona a 23-9 lead. Following Duarte’s touchdown, Wolford pitched the ball to receiver Richard Mullaney, who passed to Marquis Bundy for the game’s only successful two-point conversion attempt. The game marked a return to Sun Devil Stadium for Bercovici, where he played for Arizona State in the 2011, 2013, 2014 and 2015 seasons. He redshirted in the 2012 season. “It was special,” said Bercovici, who will be the only AAF quarterback to play at his college stadium this season. “As soon as I got off the plane, everything seemed normal.